I've been feeling pretty good being mostly raw. I'm going to just keep going with it now that it's March; I'll stay with using fruits as sweeteners, staying away from sugar and filling my plate with veggies before anything else. I'm trying to drink green juice on a regular basis; this morning I had one made of kale, mixed greens, green apple, lemon juice and coconut water. I've been reading up on chlorella and all of the benefits: better digestion, improved immune system, anti-cancer and I want to start taking it on a daily basis. I bought the powder and the only problem is it doesn't taste that great. This morning I put 1 tsp in lemon water and drank it down quickly; it was pretty awful, I'm not going to lie lol. So, I'm going to put it in a yummy smoothie or something that has dates or bananas in it to try to offset the taste. It's a bright green powder; you can also get chlorella in tablet form. 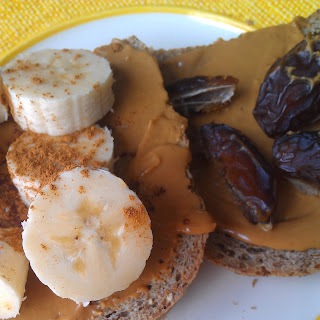 The other day I had two pieces of toast topped with peanut butter and bananas and dates. I put 1 tbsp of pb on each piece so that I stuck to one serving. I made an awesome salad last night that was jam packed with nutrients! 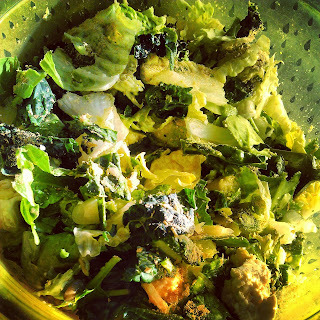 Kale, romaine, mixed greens, tofu, pumpkin seeds, avocado and an olive oil, lemon pepper, ginger dressing. 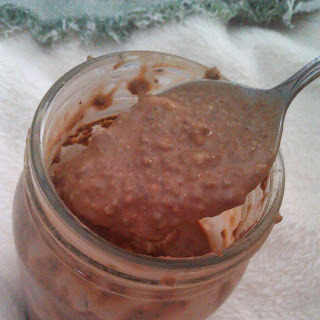 This morning I had chia seed chocolate pudding. I always make this in a mason jar. I put 1 cup of oat milk in the jar, 2 tbsp of chia seeds and a scoop of chocolate protein powder, shake it up then slice a banana into it. Pop in the fridge for at least 20 minutes and it's ready to eat! I can't wait for the weather to break so I can go for a nice long run outside. I thought I could squeeze a run in at my favorite park last weekend when it was warm but nothing was shoveled, I couldn't even see the running paths. So annoying!! And now we're getting more snow on Monday. I can't wait for spring when I can start doing 8 mile Saturday runs. Lately, I've done HIITs- high intensity interval training. I sprint on the treadmill then do strength training consisting of abs, arms and squats in between the sprints. It's a great invigorating workout. I've had a few bouts of nausea lately; I get these from time to time and I haven't pinpointed a reason why. I went to a GI doctor a couple years ago and he did all kinds of tests which resulted in nothing-there was nothing wrong with my stomach. So, every once in a while I have episodes of nausea that lasts a couple hours to a couple days. So yesterday I woke up with nausea and I still have it. Just trying to keep eating clean, drinking water and exercising. I'm also going to limit fruit to 4 servings a day in case it's the sugary fruits. Anyway, I want to publish another cookbook so I need to get in the kitchen! This will require me to test my recipes that aren't necessarily raw but they are still going to be super healthy. Stay tuned! !